The Valentine AT is a British tier 3 tank destroyer. This experimental tank destroyer had the gun mounted in the middle of the hull behind a gun shield. A prototype was built, but work on the vehicle was discontinued when a new tank destroyer was developed, based on the Valentine and mounting the powerful 17-pounder. 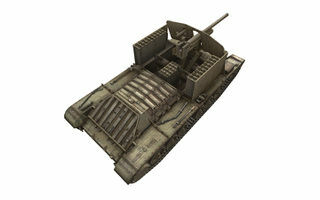 The Valentine AT is a tank with good hull armor, based on the tier 4 Valentine light tank. However, its gun is extremely vulnerable to attack since it is only protected by a very thin layer of armour. The Valentine AT offers two different play styles. It has a great gun traverse arc and offers very powerful guns. 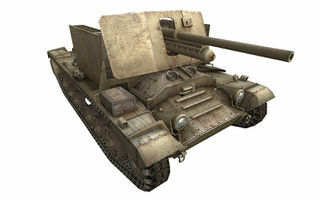 It can either be a deadly sniper when equipped with the accurate and high-penetrating 6-pdr, or a close combat brawler capable of destroying Tier 4 vehicles with a single shot when equipped with the huge 3.7-inch howitzer. 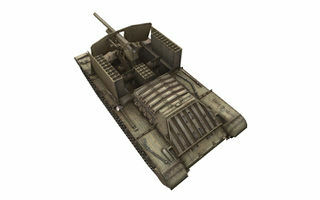 The Valentine AT is much slower and larger than its predecessor but compensates with improved armor. The Valentine AT leads to the Alecto. Extremely high DPS when equipped with the 3.7 inch AT Howitzer. "She may be small, but she has teeth." This quote was originally used to describe DS9's Starship Defiant, but it applies equally well to the formidable Valentine AT. The Valentine, on which this tank destroyer is based, is a tier 4 heavy masquerading as a light. As such its 60mm of frontal armour is capable of deflecting damage, and lower tier vehicles may struggle to penetrate. However, the Valentine AT isn't difficult to hurt, since its gun shield is wide and only 14 mm thick. A HE round to the gun shield will result in a quick return to the garage. Furthermore, the open-top hull is very vulnerable to enemy SPG fire; getting hit by one will result in heavy damage and crew fatalities. Speed and mobility aren't the Valentine AT's strong points. The vehicle accelerates slowly and has a modest top speed. However, its hull traverse rate is extremely good, allowing the Valentine AT to defend itself from attack surprisingly well. The Valentine AT makes up for its setbacks with great armament selection. It offers a choice between a 6-pdr or 3.7-inch howitzer. The 6-pdr is similar to those found on the Churchill III and Matilda Black Prince tanks but it's accurate, aims quickly, has great penetration, decent damage and a good rate of fire, making it a great medium ranged shooter. The 3.7-inch howitzer is very powerful, being a tier V gun, capable of taking out most tier III and IVs with as little as one well-placed shot. While the aiming speed and reload times are relatively slow, with a higher shell drop than its other guns, the damage potential is extremely high. An experienced tanker can compensate these setbacks by aiming ahead and leading for moving distant targets but can be used in a pinch when you're in a tight spot versus a nimble opponent, such as Light Tanks. The only British TD trainer currently in the game is the AT 15A, a rolling fortress with similar speed and tough hull armour. There are many similarities in play style, albeit at tier 7. However the Alecto, which follows the Valentine AT, plays very differently, which will likely come as a shock to new players. It is recommended to research the radios at first, in order to have radio contact to support your team. Tracks should be researched to increase load weight. Engines should only be researched now, as this is one of those British tanks whose engine upgrades are strange and make little difference, even with an extra 30bhp. 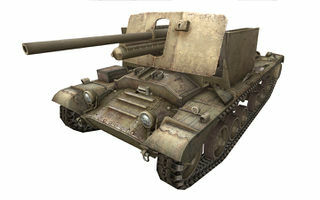 The second 6pdr cannon is the most direct path to the Alecto, and provides the same firing rate with much needed penetration. The howitzer provides much less penetration but can, with the extreme increase of damage, repel most tanks with one hit, effective when covering a small alley or path, however, the shot fired from the howitzer curves upwards before making contact. The Valentine TD was apart of a plan to create a simple tank destroyer. It was to be equipped with a 6pdr gun in its field cartridge on the hull rather than using the turret. The work was discontinued when the Valentine was able to equip a 6pdr in the turret and newer plans were made for a better tank destroyer to be built on the same chassis. This page was last modified on 9 April 2018, at 13:37. This page has been accessed 96,536 times.